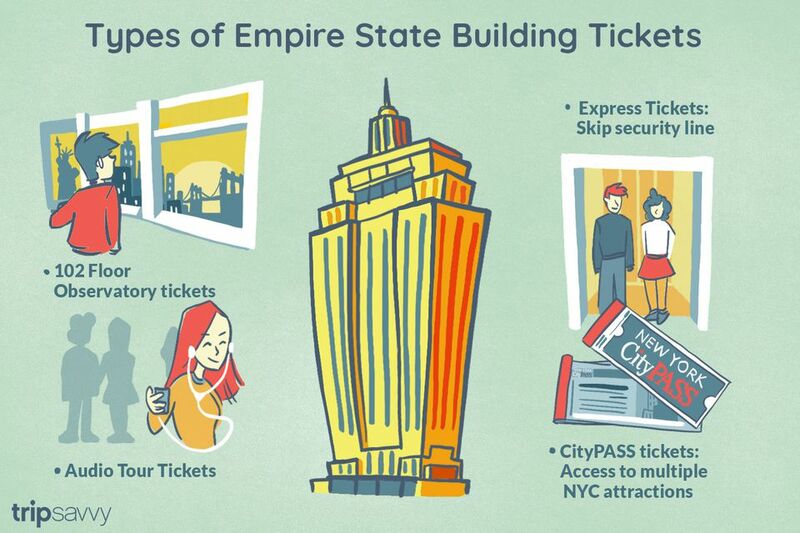 To visit the Empire State Building, you'll need to purchase a ticket, wait in a long line, and clear security. There are, however, different kinds of tickets that can speed up the process as well as give you behind-the-scenes access to the building. Whatever you do, don't be tricked into buying a ticket off sidewalk salesmen; usually, they're more expensive than the regular passes. Military personnel in uniform and children ages 5 and under can see the ESB for free, but all other visitors require a ticket. You can purchase Empire State Building tickets in advance, on-site or as part of a New York City attraction pass. All visitors to the Empire State Building will have access to the 86th Floor Observatory. If you want to see more of the building, pay a little extra for an audio tour, entrance to the enclosed 102nd floor observatory, or express access, which allows you to skip to the front of the security and elevator lines. The express ticket is especially nice during the New York City's peak seasons in the summer and holidays. If you purchase your Empire State Building Tickets in advance, you'll be able to skip the ticket line which can easily save 20 minutes. Note: Tickets you purchase in advance are good for one year. The best prices for online tickets to the Empire State Building are available through Viator, however, due to limited inventory, you can only purchase advance tickets to the 102nd Floor Observatory directly from the Empire State Building website. Access to the 102nd Floor Observatory requires an additional ticket. These are available in advance if you buy directly from the Empire State Building or day of if you wait in the regular Empire State Building ticket line. You also have the option to purchase the 102nd Floor Observatory ticket as an add-on once you arrive on the 86th Floor. We recommend buying an express ticket to the 86th Floor Observatory and paying for the upgrade to the 102nd floor​ if you decide you want to see more. You can purchase an audio tour with your advance ticket or you can buy an audio tour at the ticket booth in the Empire State Building. The audio tour is self-guided and consists of seven three-minute segments that help visitors identify various important sights that you can see from the Empire State Building. Audio Tours are available in English, Spanish, Italian, French, Japanese, Mandarin, Korean, and German. ﻿Visitors can pick up audio tours on the 2nd floor (same floor as ticket sales). Express tickets allow visitors to skip to the front of the security and elevator lines. This can save visitors significant amounts of time, particularly during the Big Apple's busiest tourist seasons. Express tickets are available for visitors who want to visit the 86th Floor Observatory, as well as the 102nd Floor Observatory. As with other tickets, you can only purchase the 86th & 102nd Floor Express Combination Ticket directly, but the 86th Floor Express Ticket is available from Viator as well. Both the New York Pass and New York Explorer Pass can get you into the 86th Floor Observatory, but be aware that you'll have to wait in the ticket line to show your passes in order to get your ESB ticket. Think You Know Everything About the Empire State Building? How Can You Visit the Chrysler Building in NYC?